Shortly after Apple announced the iPhone 5 on stage last Wednesday, we confirmed the company chose to go with the nano-SIM card as its new standard to support LTE. 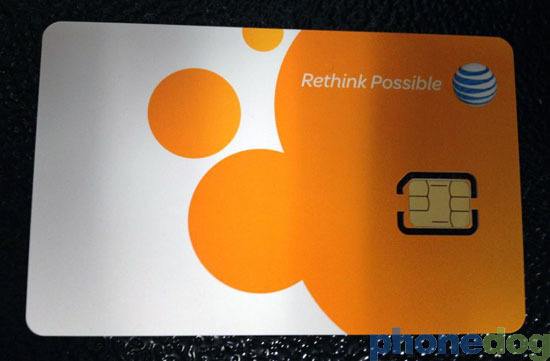 We got a closer look this evening at the first official nano-SIM card from the world’s biggest iPhone carrier, AT&T. You will see the 76mm of plastic above—which you will surely become familiar with over the next few days. As you can see, the nano-SIM looks roughly 40 percent smaller than the micro-SIM that first debuted on the iPad 3G. We got a look at another U.S. carrier last week, T-Mobile’s nano-SIM. T-Mobile launched an aggressive campaign trying to persuade unlocked iPhone customers to come over to its Magenta network for “big savings.” For those across the pond, we also got a look last week at Vodafone’s nano-SIM offering. I’m happy to report that the card, even at 0.70mm, continued to work when inserted in an HTC One X. Sanding the non-metal side of the micro-SIM did not appear to affect how it functions. Do note that in the process, the fine dust from the sanding smells terrible and may irritate your nose, so wear a face mask if you are going to attempt this. As of now, this micro-SIM’s length and width has not been cut down to become a nano-SIM, simply because there’s no iPhone 5 to test it with. I will finish the job and test it out once Apple’s smartphone is available later this week. On a related note: CNN posted a great graph showing where the iPhone will have 4G LTE coverage in the U.S.